This hearty slow cooker meal is sure to please your hungry family after a busy day. Serve up a generous helping of this tender pork and flavorful beans with a slice of warm corn bread. Mmm! So good!! 1. Cut pork loin roast in half. * Place in a 5 quart slow cooker. Top with the sliced onions. 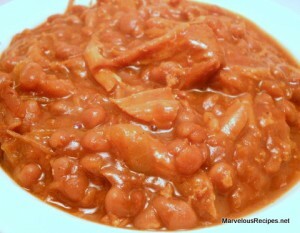 In a medium size bowl, combine the beans, barbecue sauce, brown sugar and garlic powder. Pour mixture over the meat. 2. Cover and cook on Low for 6 hours or until meat is tender. Remove cooked roast and shred using two forks. Return the shredded meat to the slow cooker and heat through. Makes 10 servings. *3 pound or larger roasts should be cut in half to ensure proper and even cooking in a slow cooker. Also, trim as much visible fat from the roast as possible to avoid greasy gravy.